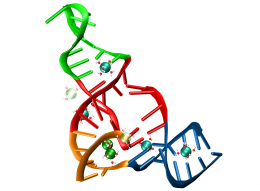 New research at Oak Ridge National Laboratory explains how a ribonucleic acid enzyme, or ribozyme (pictured), uses magnesium ions (seen as spheres) to accelerate a significant reaction in organic chemistry. (PhysOrg.com) -- Supercomputer simulations at the Department of Energy's Oak Ridge National Laboratory are helping scientists unravel how nucleic acids could have contributed to the origins of life. A research team led by Jeremy Smith, who directs ORNL's Center for Molecular Biophysics and holds a Governor's Chair at University of Tennessee, used molecular dynamics simulation to probe an organic chemical reaction that may have been important in the evolution of ribonucleic acids, or RNA, into early life forms. Certain types of RNA called ribozymes are capable of both storing genetic information and catalyzing chemical reactions  two necessary features in the formation of life. The research team looked at a lab-grown ribozyme that catalyzes the Diels-Alder reaction, which has broad applications in organic chemistry. More information: The research was published as "Magnesium-Dependent Active-Site Conformational Selection in the Diels-Alderase Ribozyme" in the Journal of the American Chemical Society.